Sojourner Truth (1797 - November 26, 1883) was the self-given name, from 1843, of Isabella Baumfree, an American abolitionist and women's rights activist. Truth was born into slavery in Swartekill, New York. Her best-known speech, which became known as Ain't I a Woman?, was delivered in 1851 at the Ohio Women's Rights Convention in Akron, Ohio. Sojourner Truth addresses the subject of equality at the 1851 Women's Convention in Akron, Ohio. FCIT. "Sojourner Truth author page." Lit2Go ETC. Web. 20 April 2019. <https://etc.usf.edu/lit2go/authors/113/sojourner-truth/>. FCIT, "Sojourner Truth author page." 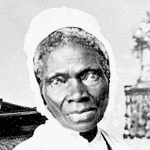 Accessed April 20, 2019. https://etc.usf.edu/lit2go/authors/113/sojourner-truth/.